The Global Colours Makeup is activated with a small amount of water. Simply moisten your brush before applying the makeup. This will enable the colours to burst into life. Best used with a 3/4" brush for example a TAG No 12 or Loew Cornell 3/4" 7000 series brush. Water (Aqua), Calcium Carbonate, Acacia Senegal Gum, Glycerin. Conforms to ASTM D4236, USP 61 Microbial limits tests, US California Prop 65 and CE-EN71 part 3; 1194. 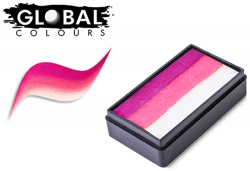 Click here for a Material Safety Data Sheet for Global Colours Fun Strokes.